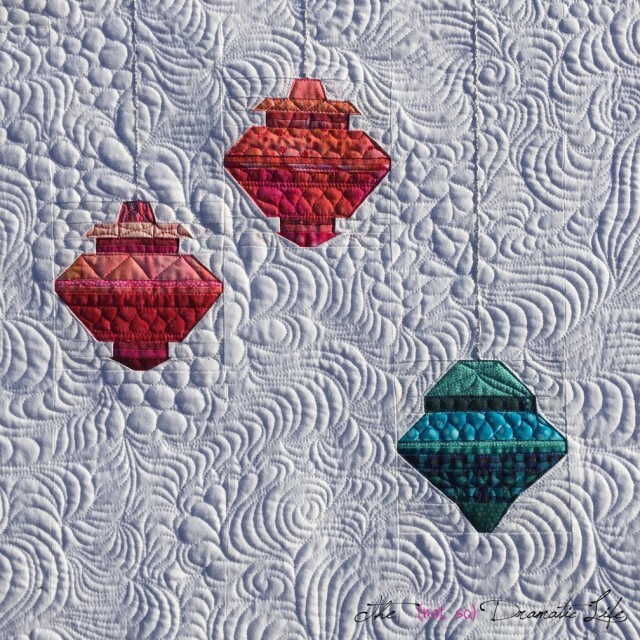 Baubles is one of my oldest UFOs, and I am thrilled that I finally finished it up this week! The blocks were designed on EQ7 when I was first experimenting with the program. 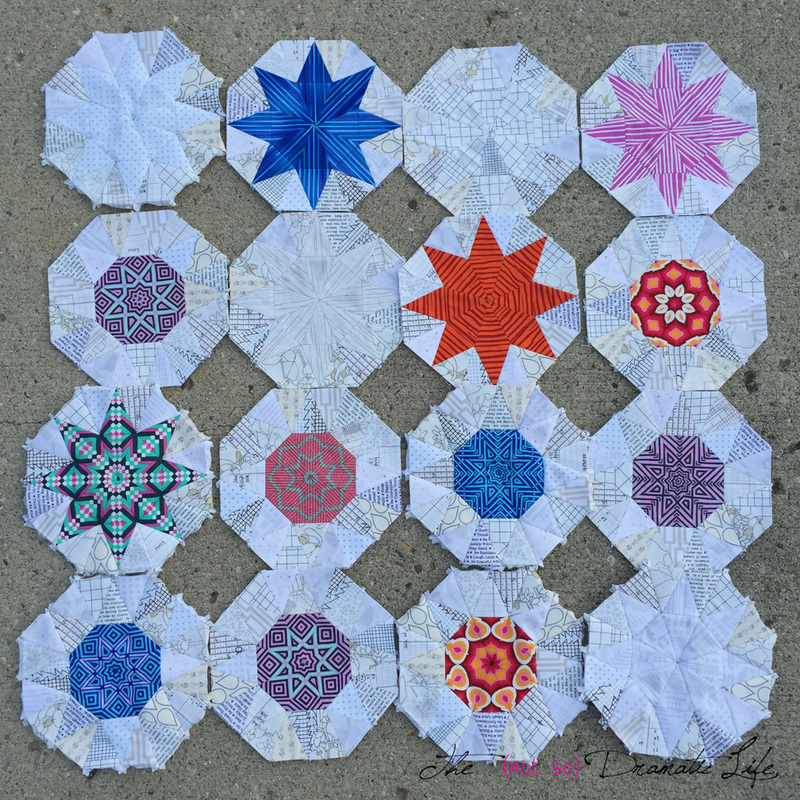 These are some of the first paper piecing blocks that I designed from scratch. Once they were assembled, they got set aside, and I didn’t touch them for nearly a year. From the start, I didn’t have a particular plan for the blocks, but eventually I brought them together in a configuration resembling hanging ornaments. The quilting was probably the most fun of the entire project. 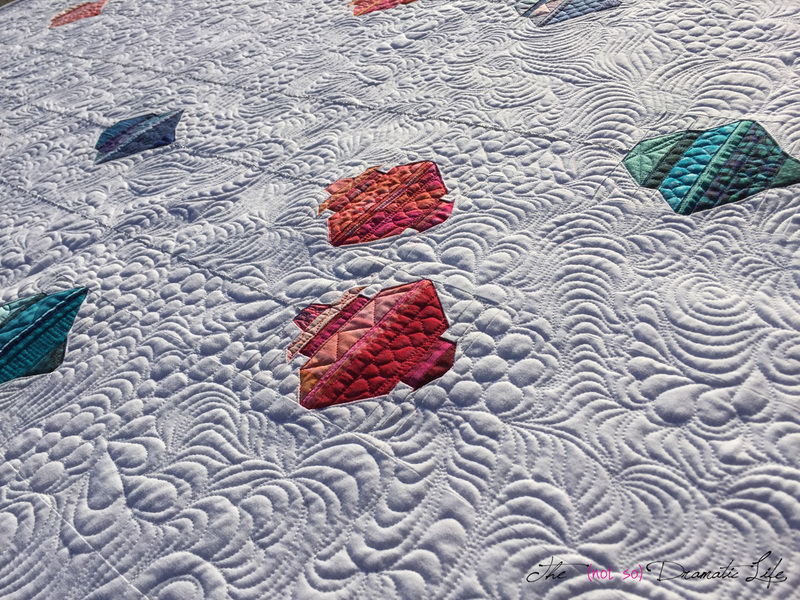 I really enjoy doing all over free motion quilting, and this quilt is done almost entirely with this technique. The only exception is that each bauble is quilted with coordinating thread and a combination of free motion and ruler work specific to each block. 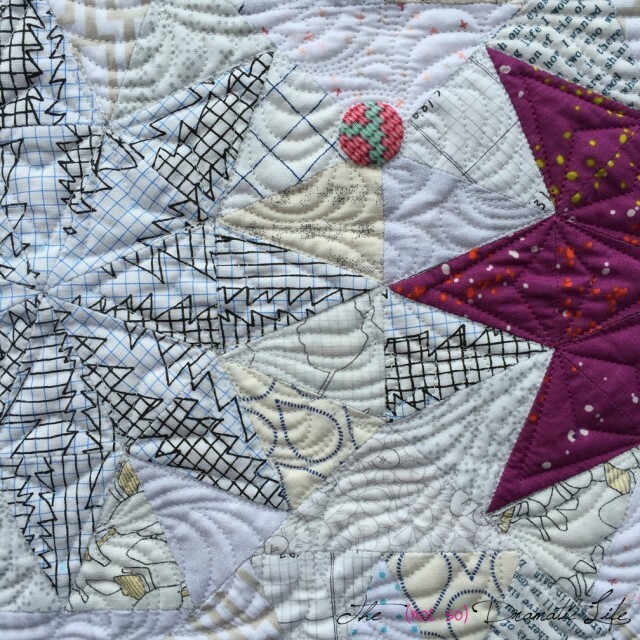 Once the quilting was finished, I embroidered silver hanging strings for each ornament. 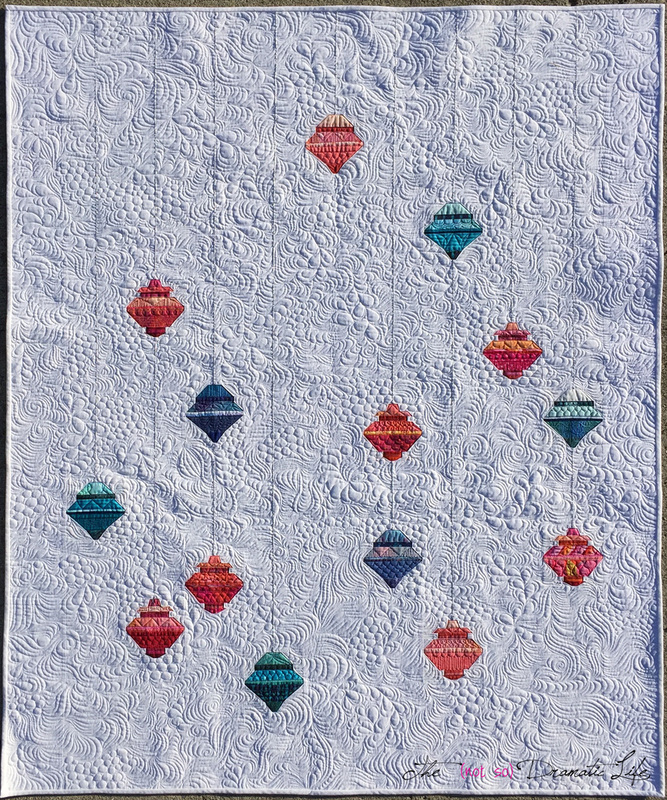 I decided to keep the binding white to allow the illusion of the baubles floating in space. Binding: White Kona, cut in 2″ wide strips on the bias, machine stitched to the front, hand stitched on the back. This quilt was my One Monthly Goal for January! 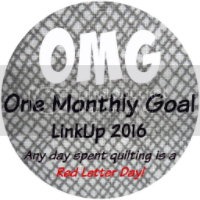 When the Modern Quilt Guild issued a challenge sponsored by EZ Quilting, I couldn’t wait. I was in the midst of a “triangle phase” so this was perfect timing. 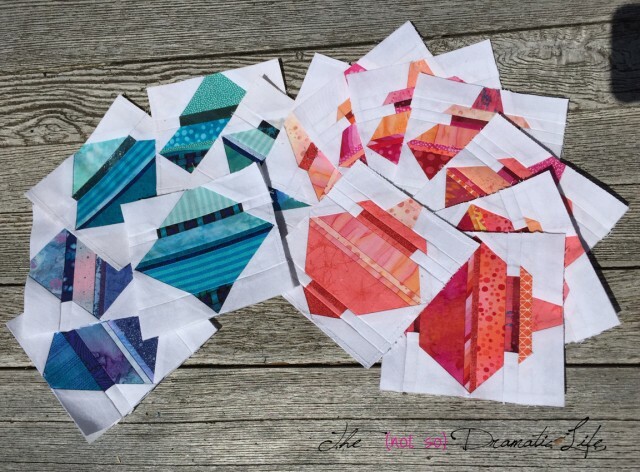 I decided that if I was going to take on this challenge, I was going to really embrace triangles, and create a design pieced entirely with that shape. 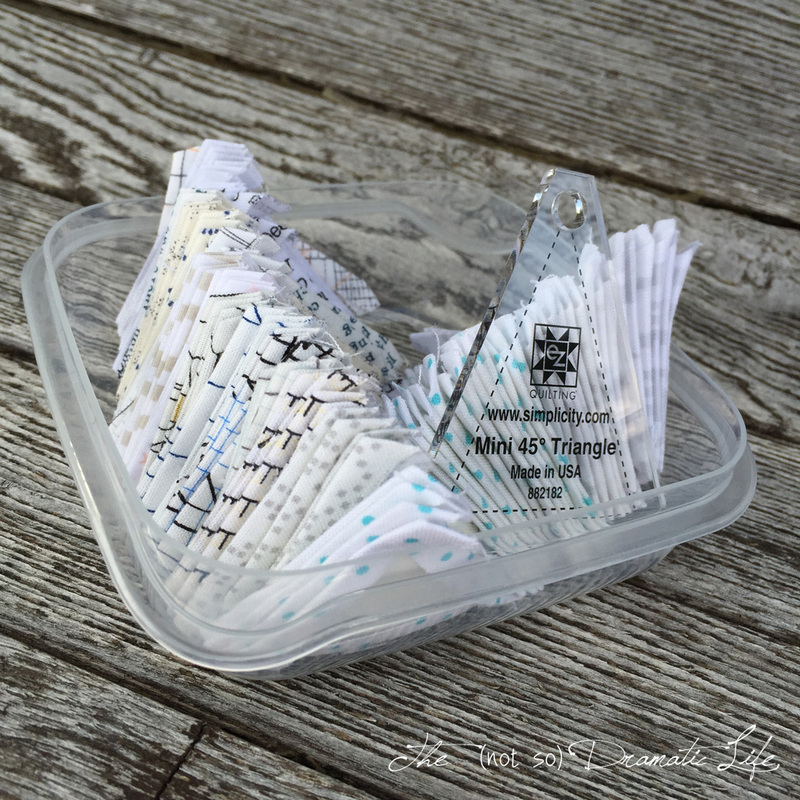 The 45 degree mini template arrived in the mail, and I began drafting. Triangles are intriguing in their ability to transform fabrics through careful cutting and reassembly. 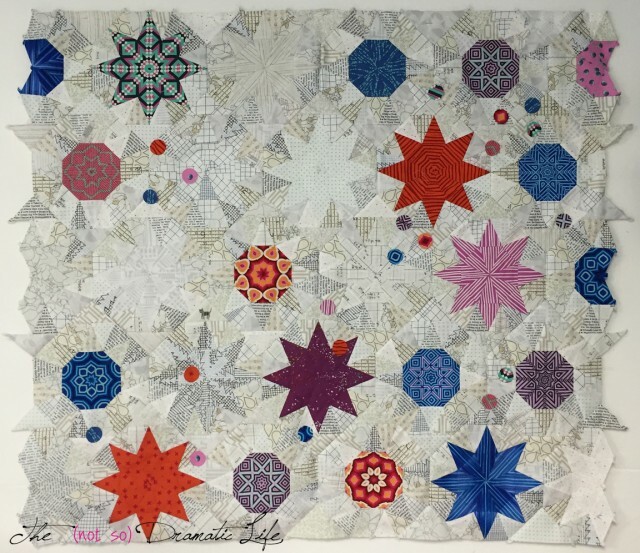 I selected quite a few brightly colored, distinctively patterned fabrics to form octagons and stars that are the focal points of the quilt. 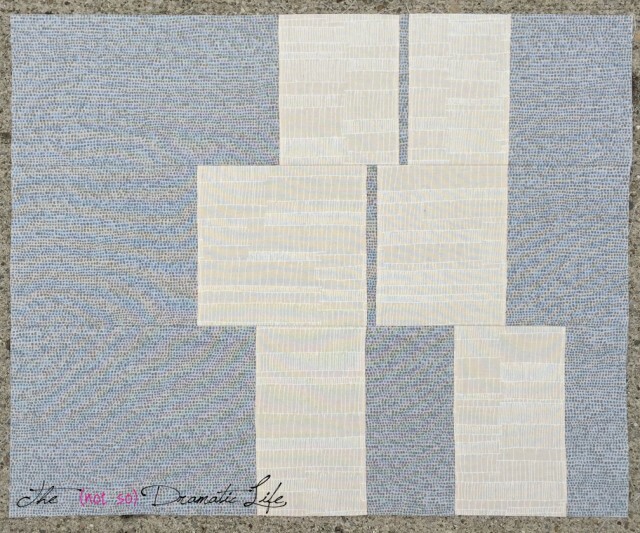 The overall design includes several blocks that are all low volume fabrics to give some areas for a visual rest. 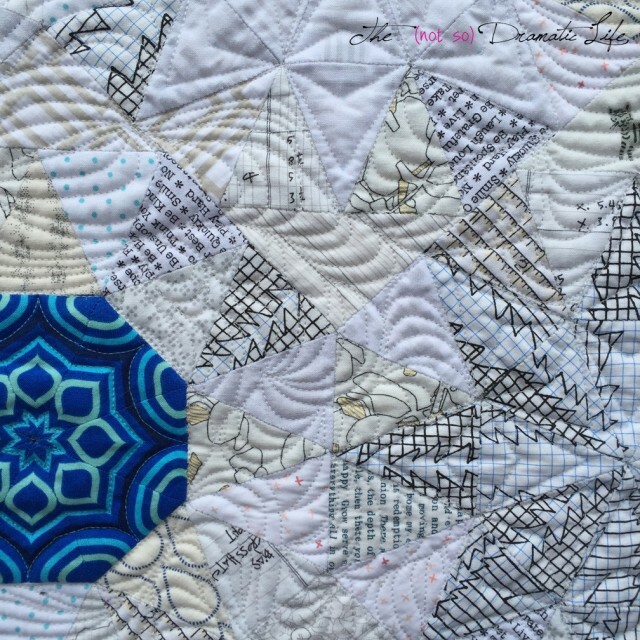 Given the small scale of the pieces of the quilt, I decided to go with an English Paper Piecing technique to insure that the corners of each triangle would match up perfectly. 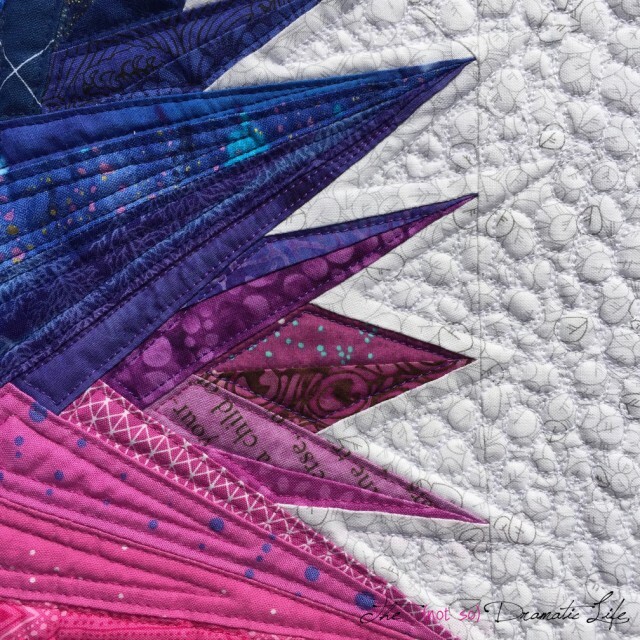 The majority of the 866 triangles in the quilt are cut with the provided template, but there are additional triangle shapes to fill in between blocks and around the edges. 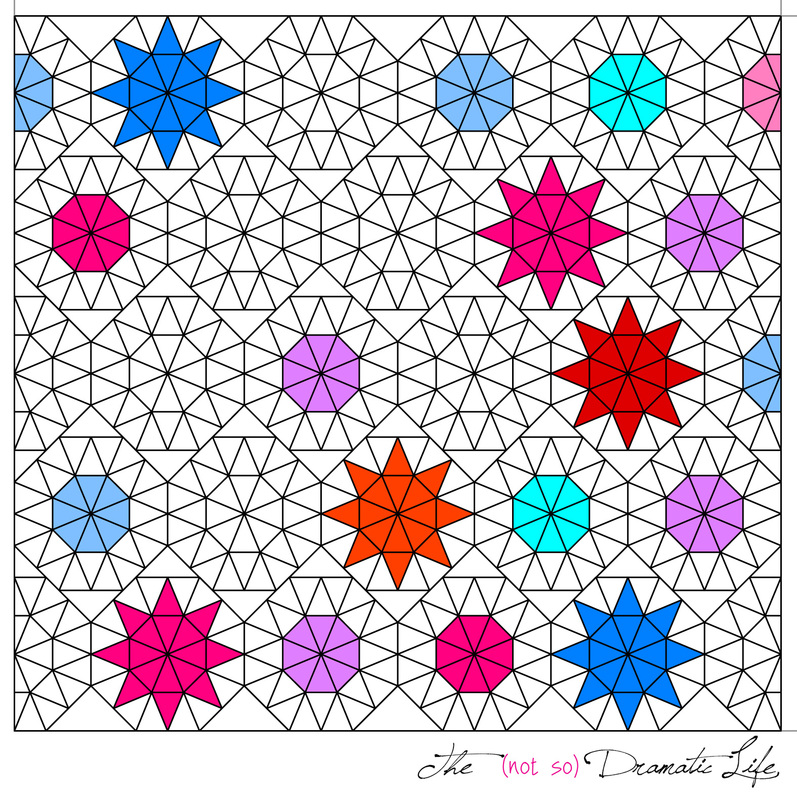 When I took a step back to look at the completed top, I decided that the all-triangle approach was a bit too rigid. I began experimenting with options to break up the field of triangles, and eventually landed on adding brightly colored appliqué circles. 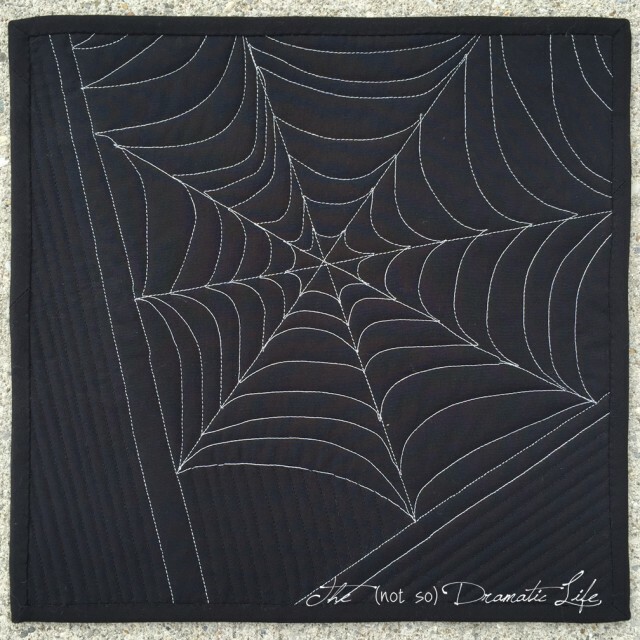 Each circle is about the size of a dime and is hand appliquéd to the finished quilt top. 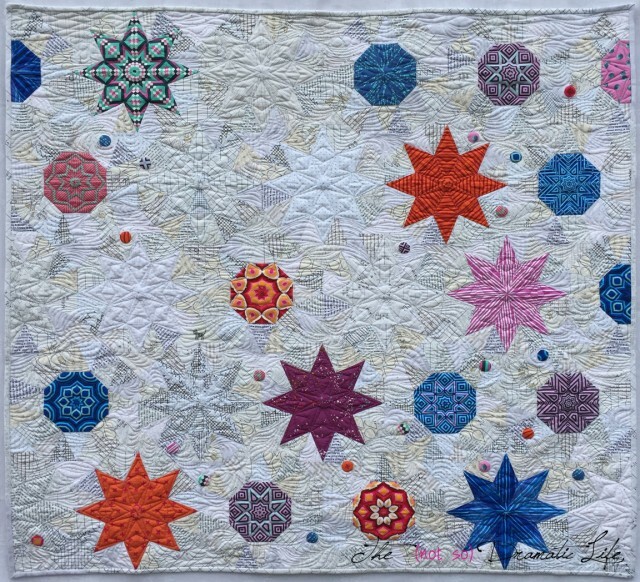 Each star and octagon is quilted with coordinating thread using ruler work on a longarm. The spaces between each of these shapes is filled with wavy, swirling, organic free-motion quilting. This quilt was my second entry into the QuiltCon contest, and I also entered this quilt into the Paducah show of the American Quilter’s Society in the category: Small Wall Quilts, Longarm Quilted. 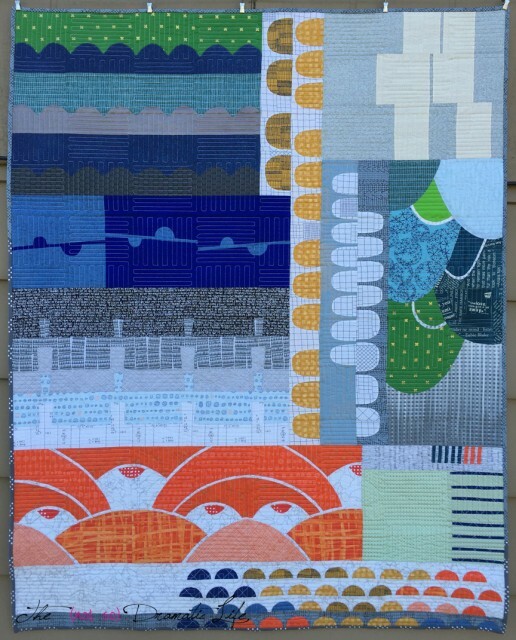 This week I finished sewing The Collection Quilt by Carolyn Friedlander. 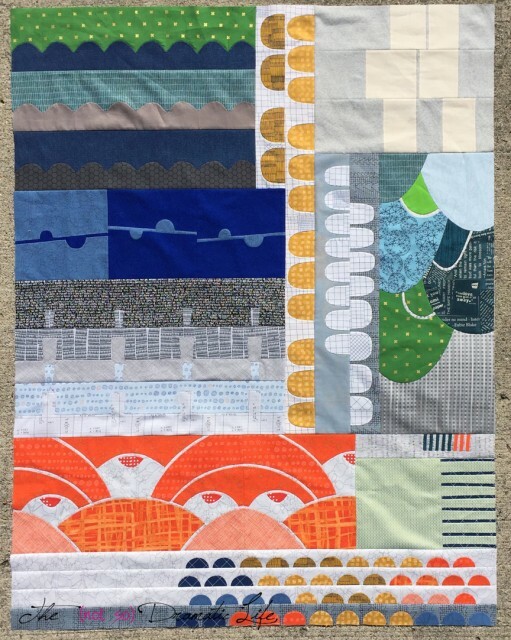 This quilt is created as a “Block of the Month” style quilt embracing the slow sewing movement- most of the design is hand sewn using needle turn appliqué. 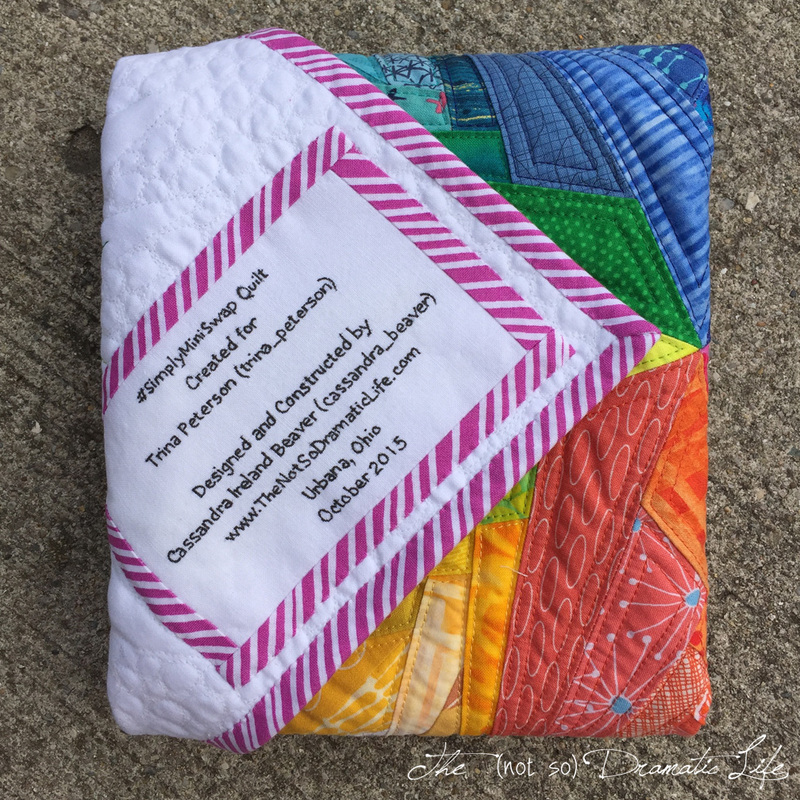 I am really excited about this quilt, and I am even more excited to be teaching this project next year at one of my very favorite local quilt shops, Sew to Speak, in Columbus, Ohio. The class will be held once a month for ten months. 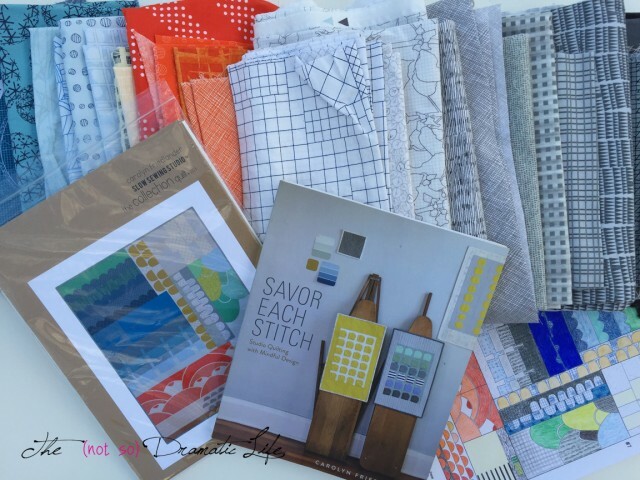 Prior to the first class, we are scheduling a day that I will be in the shop if you would like to discuss the project and fabric selection. The first nine classes will focus on one section each. The tenth class will cover final quilt top assembly, discussion of quilting options/techniques, and binding. Carolyn Friedlander has written this pattern to be very friendly to anyone just starting hand appliqué by gradually introducing new variations in each block. Section one focuses on learning basting and the appliqué stitch on straight lines. 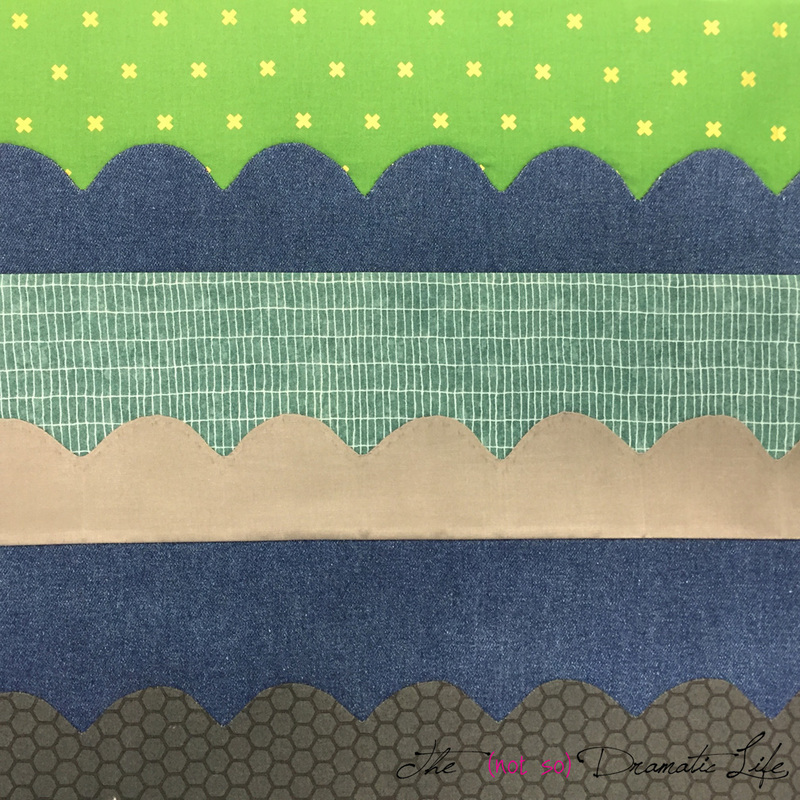 Section two introduces convex curves and allows for a lot of creativity in fabric choices. 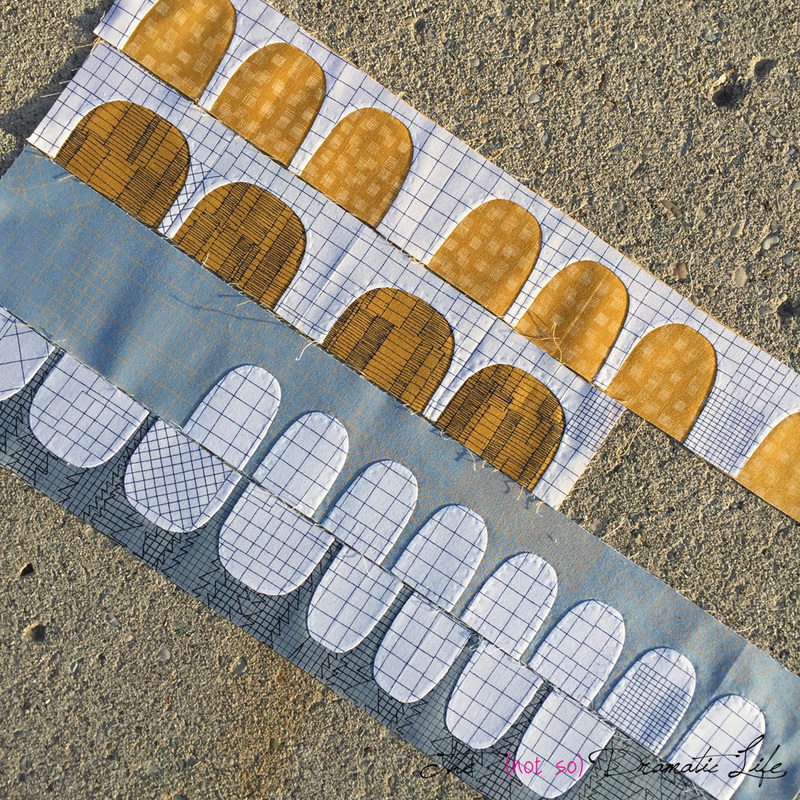 In section three you will learn reverse appliqué along concave curves. Section four teaches you to stitch to an interior point. 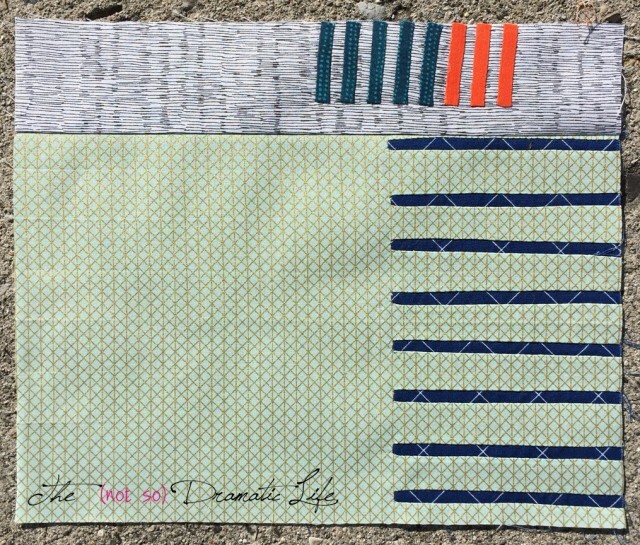 You also have the opportunity to experiment with additional fabric substrates. 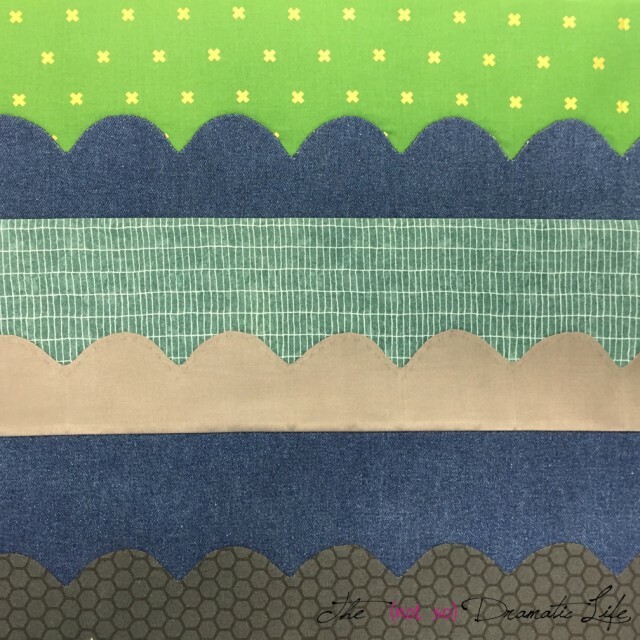 In the sample I used a lightweight denim and a cotton/silk blend. Corners are added in section five. Section six combines straight lines, corners, and curves in reverse appliqué. 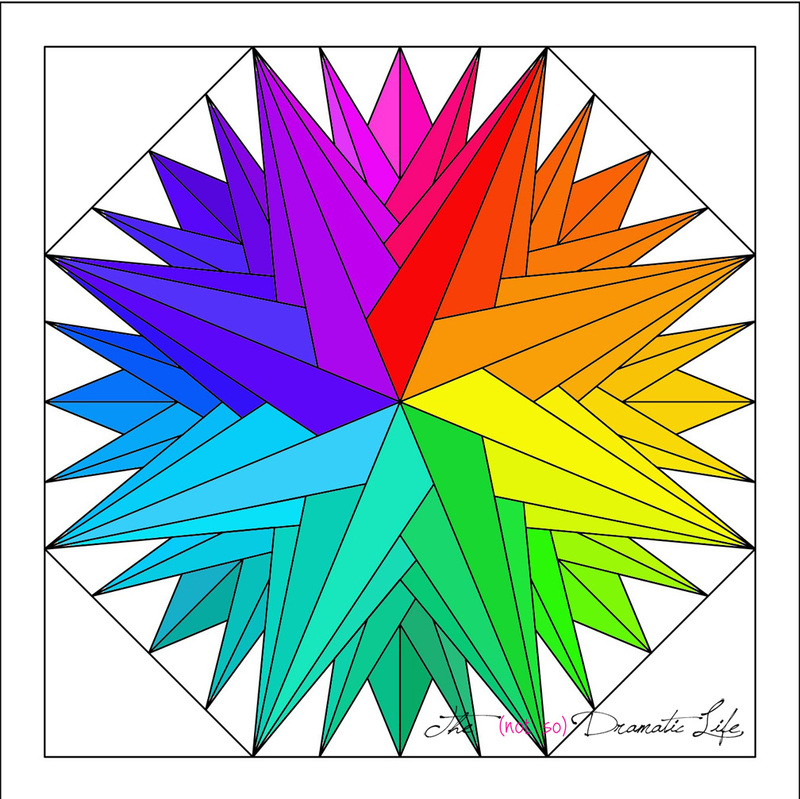 In section seven you will experience overlapping pieces. 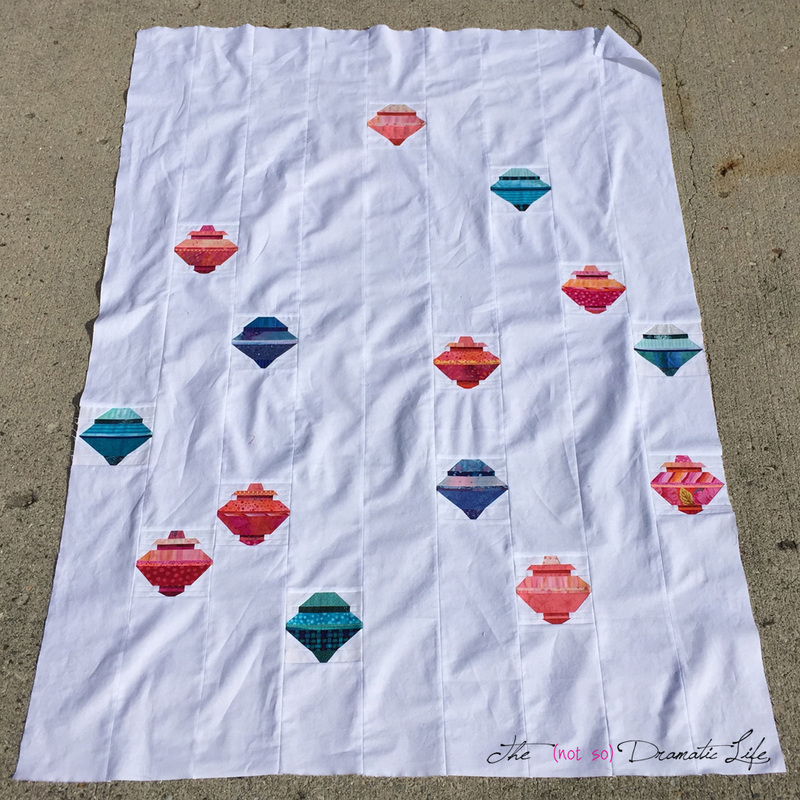 Finally, in section nine, you will create the design with narrow strips of fabric, and reverse appliqué created from cutting slits into the upper layer of fabric. 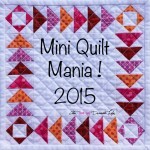 By adding new skills with each section, you will be able to make the quilt without becoming overwhelmed. 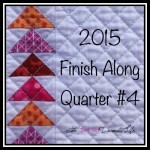 With the block completed, the final quilt top goes together quickly. 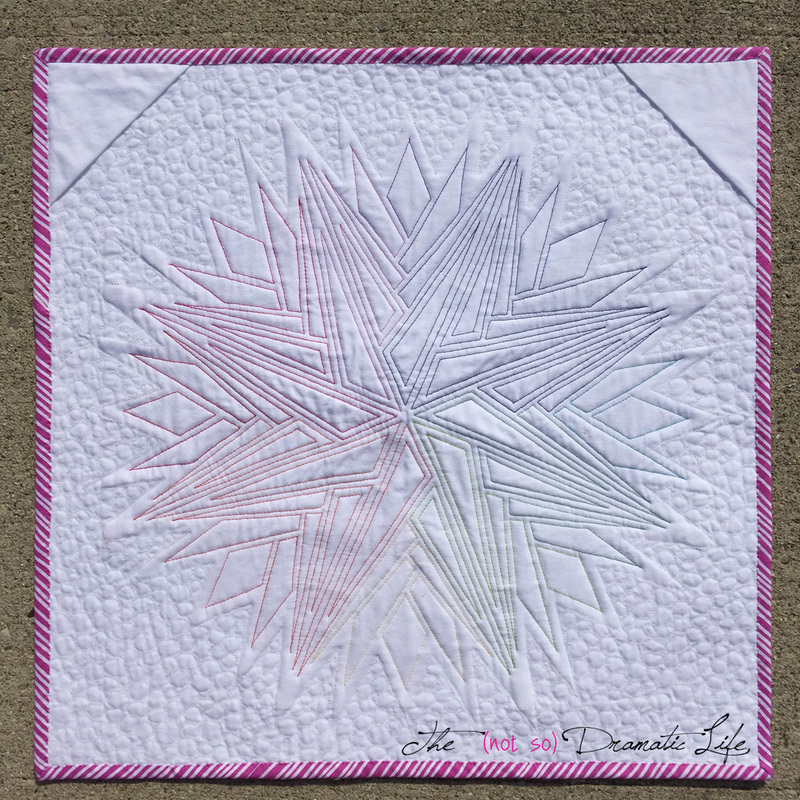 I quilted this project on my longarm using an edge to edge computerized design that I created. I thought that the linear aesthetic complemented the graphic quality of the pattern. This quilt (like most 🙂 ) looks even better in person, so if you are in central Ohio, I hope you will stop by Sew to Speak to have a look at it. Maybe you will even sign up for the class! 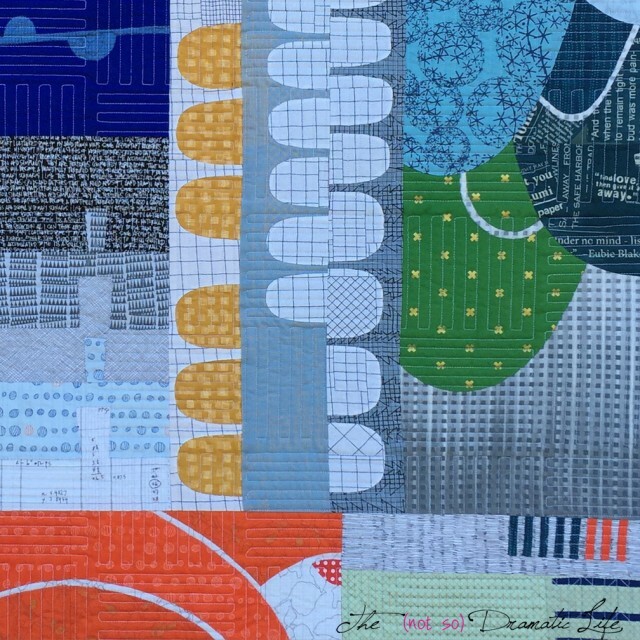 Fabric: High quality quilting cotton, including many prints designed by Carolyn Friedlander, lightweight cotton denim, a cotton/silk blend satin. Binding: Grey Carolyn Friedlander and Cotton and Steel Prints, cut on the bias in 2″ wide strips, machine stitched to the front, hand stitched to the back. Happy Halloween! 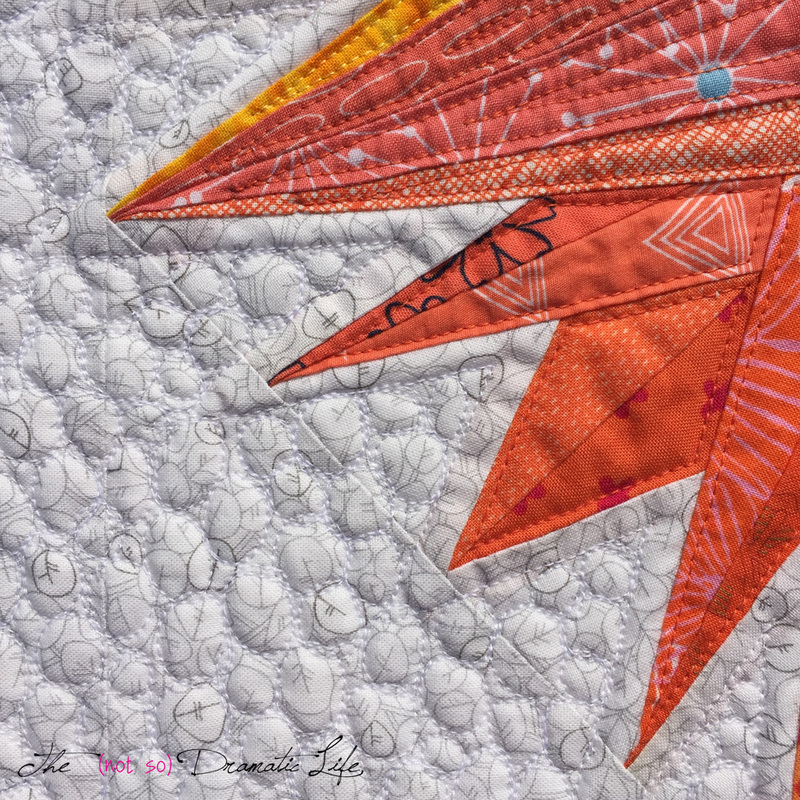 I have been eager to try out metallic threads with the longarm, and this Halloween-appropriate mini quilt was a great opportunity to experiment. The piecing on this quilt top is very simple with only five pieces. 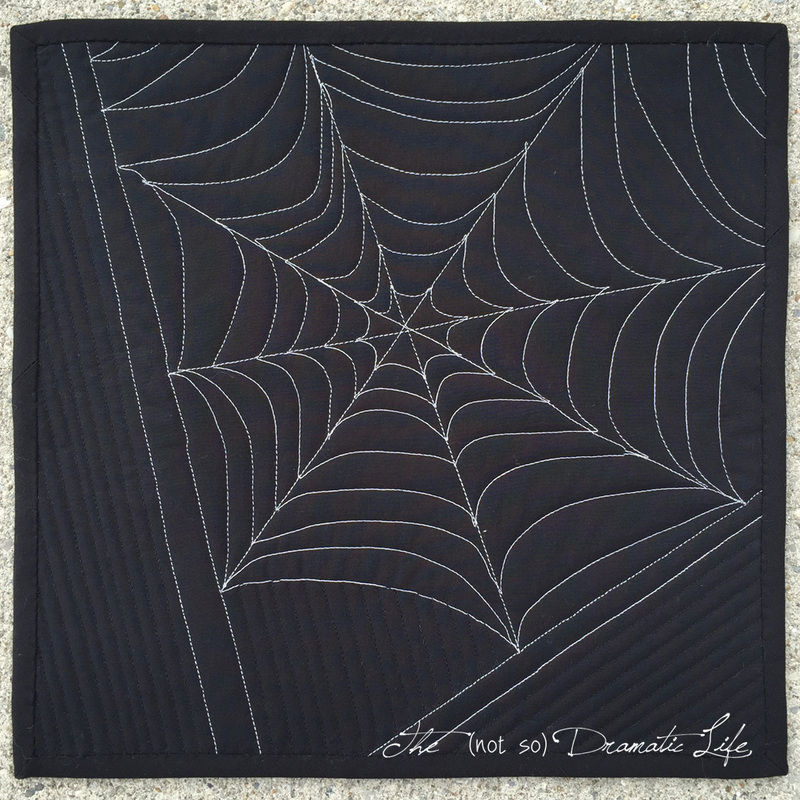 I cut a 12.5″ square out of solid black fabric and then slashed it in two places where I wanted to indicate abstract tree branches. The fabric for the trees is a batik that is actually printed to look like trees, but I cut it on the cross-grain to create a Birch tree-esque effect on a slightly larger scale. 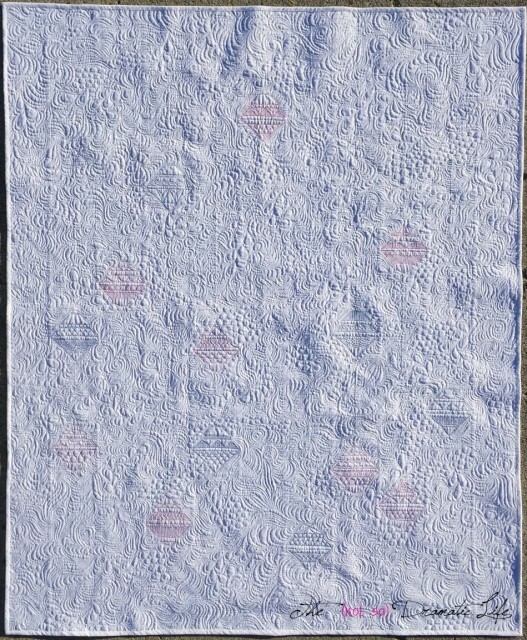 The resulting quilt top gave me a great space to play with the metallic thread. Now for the fun part! I was a bit nervous about trying metallic thread since I hadn’t yet ordered any specialty needles for the longarm. The metallic thread I chose was a silver WonderFil with a rayon core. I loaded a medium grey cotton quilting thread in the bobbin, and decided to give it a try. It was awesome! One of the nice features of the A-1 machine is a small pad that the top thread feeds through which holds a few drops of liquid thread conditioner. It really does help decrease thread breakage. 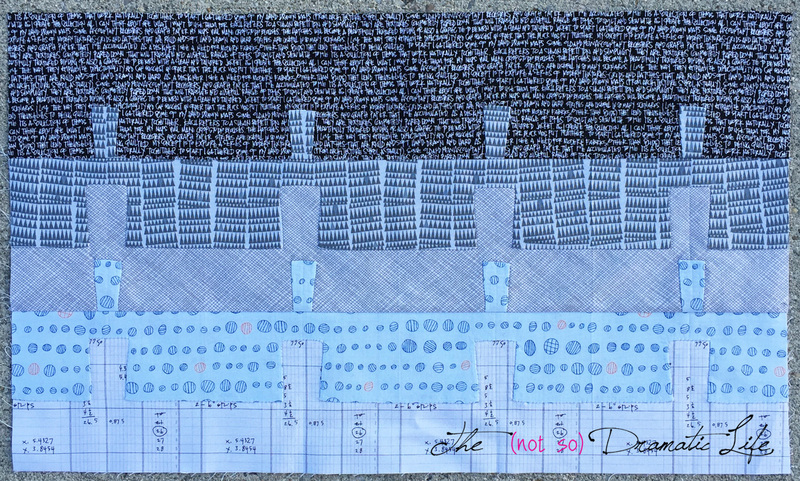 I practiced some ruler work with the main lines of the web, defining the tree branches, and some background work with black cotton thread. The curved areas of the web are free motion. The backing and binding is made from the same black fabric used in in the quilt top. The batting is Hobbs 80/20 in black which I pulled from a sample pack I received earlier this year. 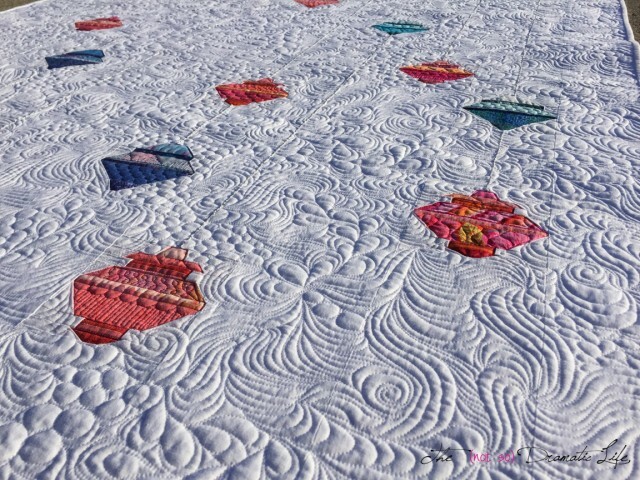 It was so nice to not have to worry about white batting working its way through the fabric of the quilt. 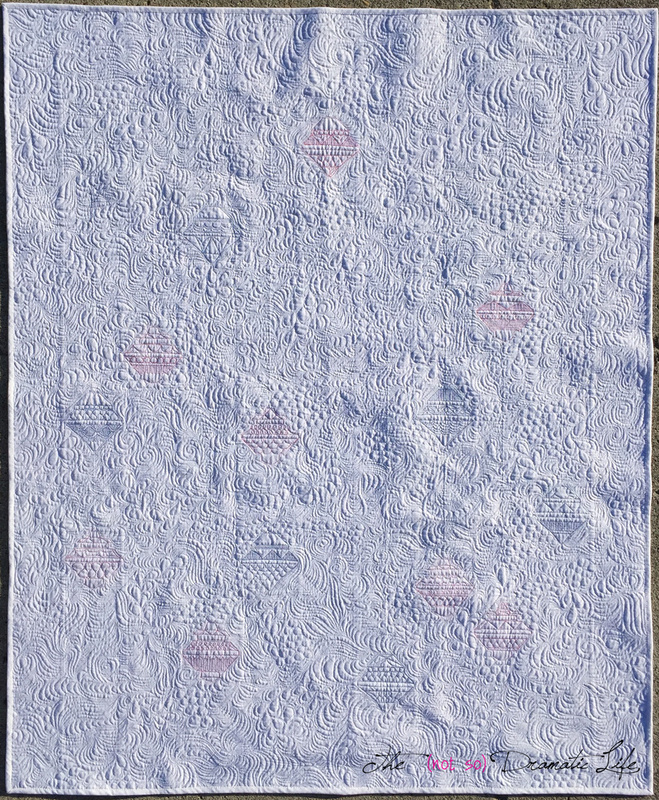 My cat adds enough white fluff to my dark quilts without having the batting contribute! A few months ago I signed up for my first Instagram mini quilt swap, and it is currently wrapping up. Now that my partner has received the mini I made, I thought I would share it here. 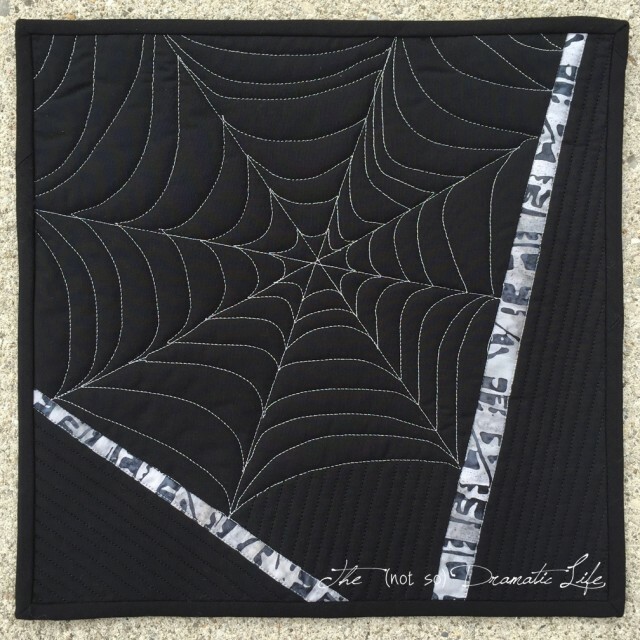 This quilt is also my entry into the Mini Quilt Category in the Blogger’s Quilt Festival at Amy’s Creative Side. 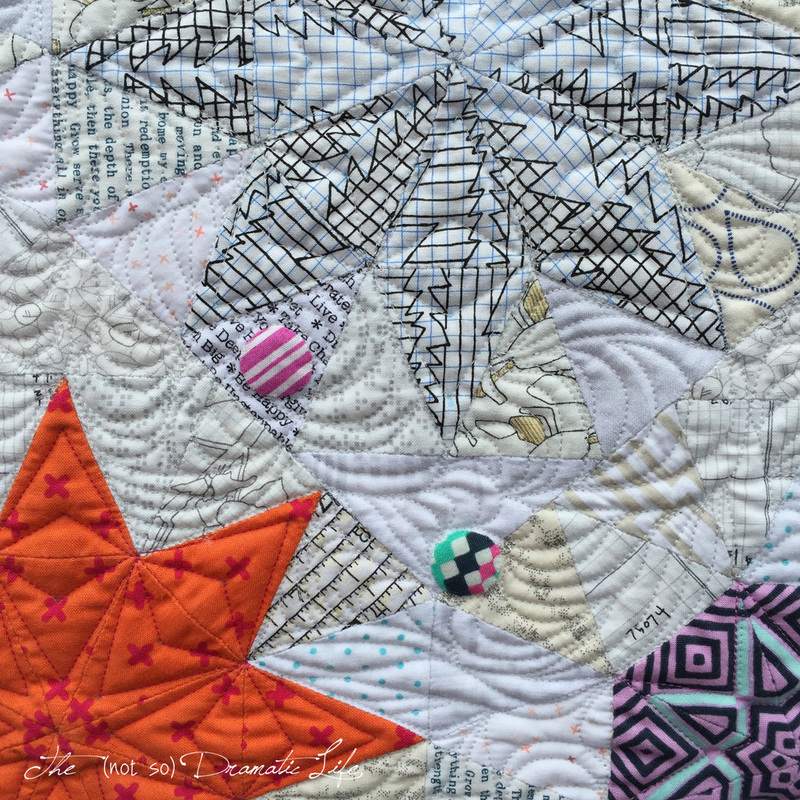 The pattern for this quilt is an original design that I drafted using AutoCad to create the foundation paper piecing templates. 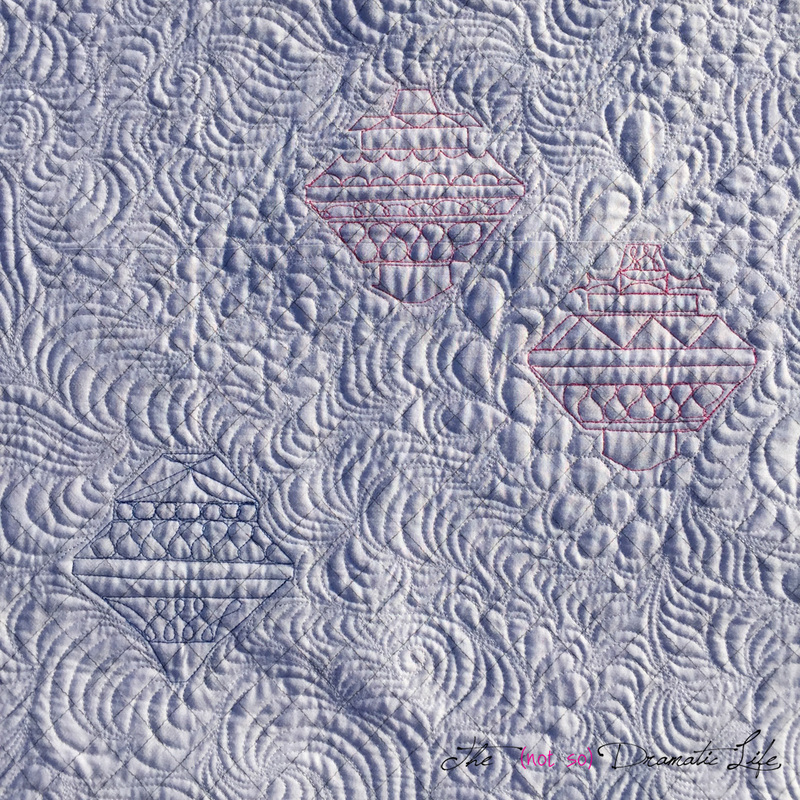 It is pieced in eight wedge shaped segments and then the corners and borders are added. There are 83 different fabrics used in this mini quilt, 80 of which form the star. Each color is intended to flow into the next which results in a rainbow effect for the central image. 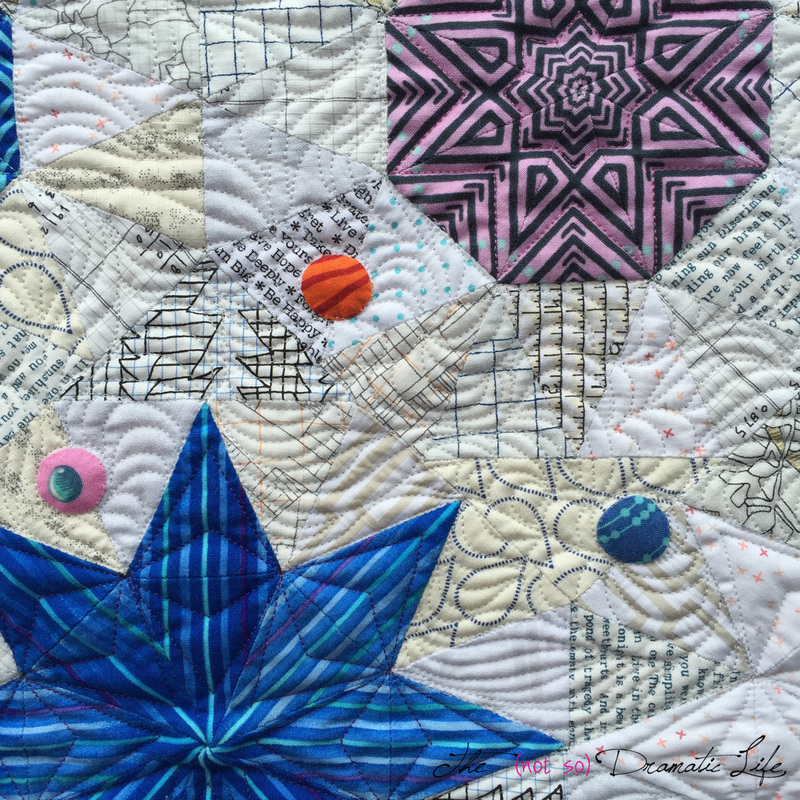 The quilting in the central star is done using a walking foot on my domestic machine with threads which coordinate with the fabric. 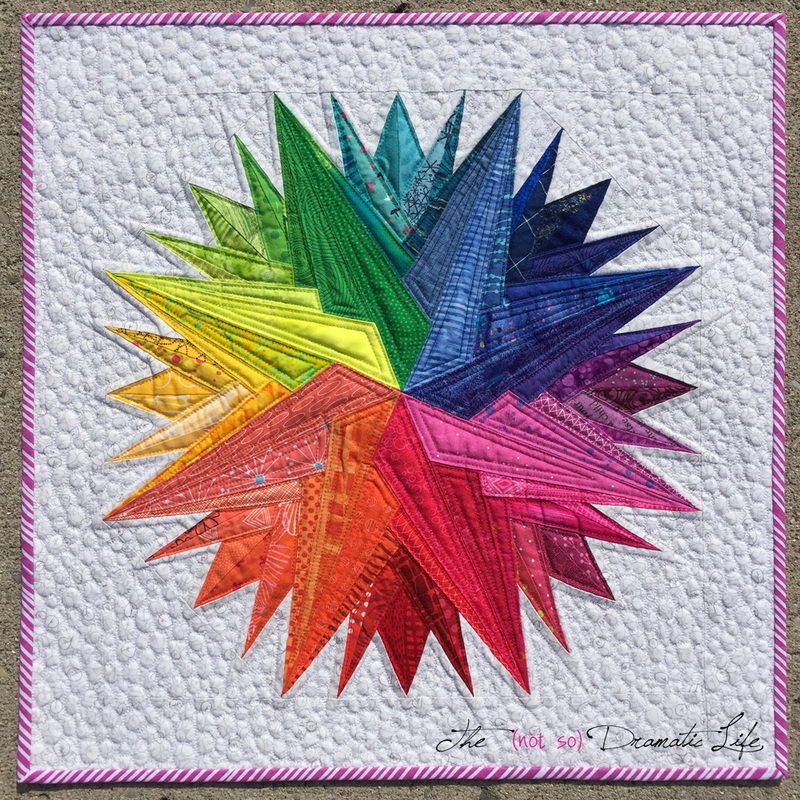 Pebble quilting fills the negative space and was done on an A-1 longarm machine. 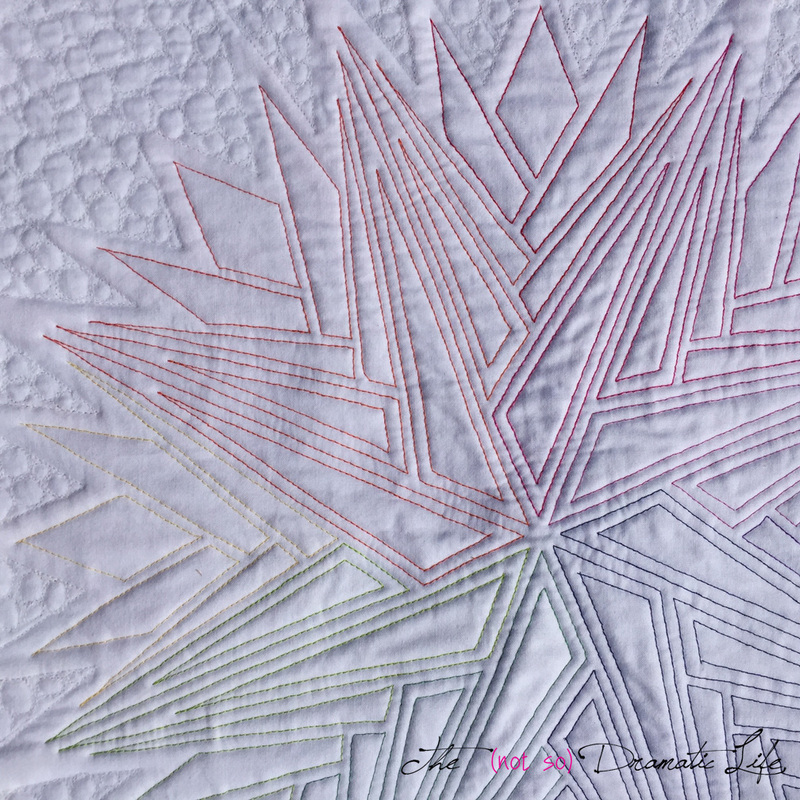 I love it when I have the opportunity to juxtapose organic elements with straight lines, and I was pleased with how the pebbling creates a delightful textural element. 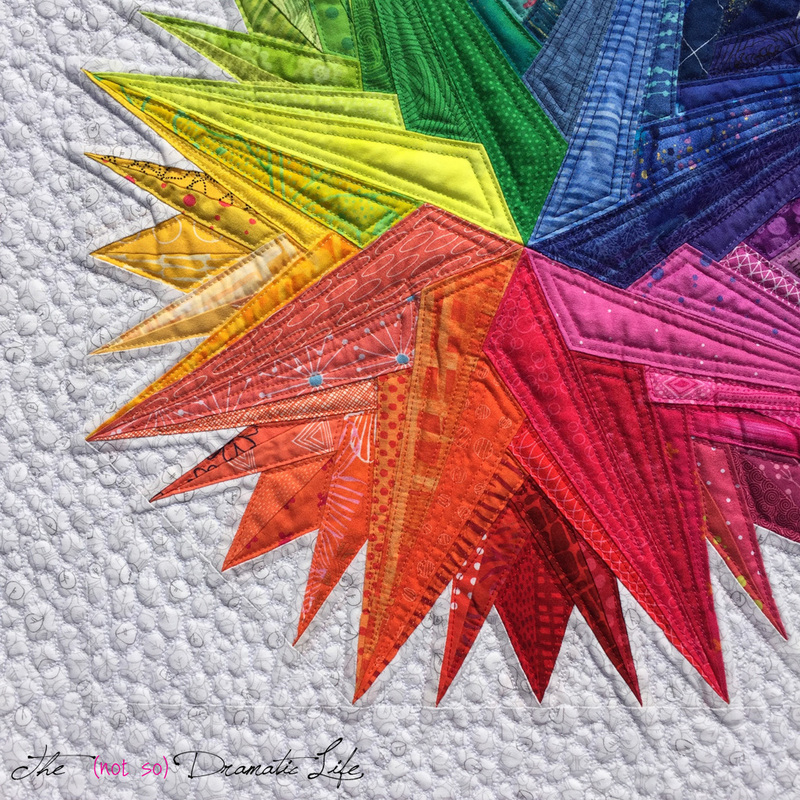 The multicolored threads transfer a subtle version of the rainbow effect to the back of the quilt. Striped binding cut on the bias frames this piece, and I used the same fabric to frame the handwritten label for the quilt.